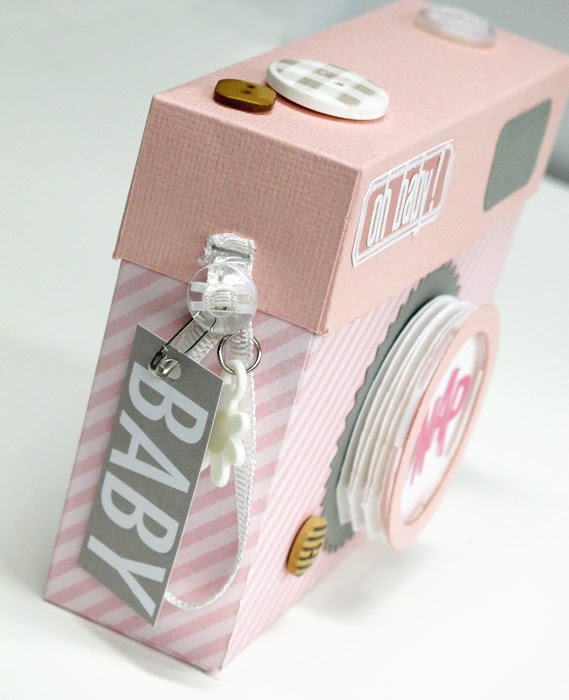 kim watson ★ design ★ papercraft: Camera shaped mini book + FREE cut file. 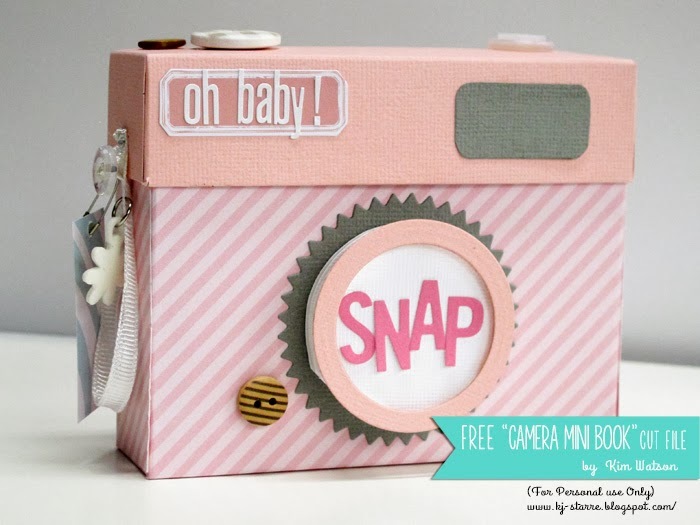 Camera shaped mini book + FREE cut file. I have a FREE cut file for you to use for (your personal use only). 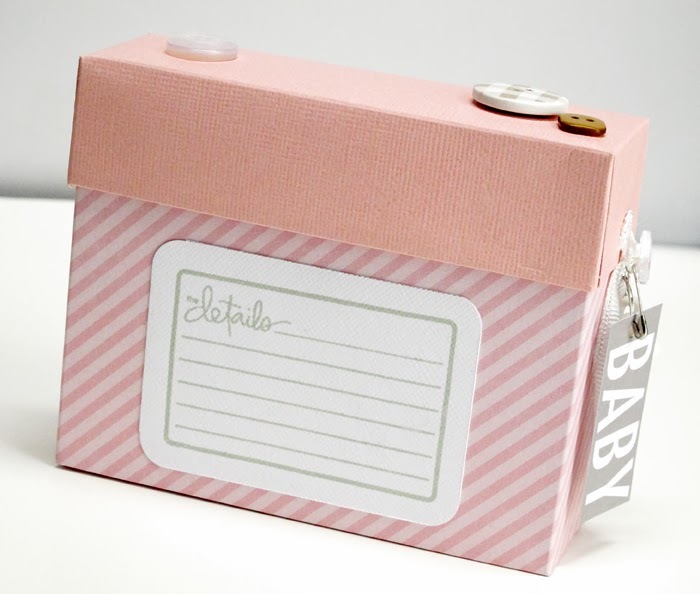 This was the original Camera mini book I created for Creating Keepsakes Magazine (as seen in the Creating Keepsakes Minibooks 2013 special issue). My FREEBIE cut file this cute little pink camera mini book and is a version of the original "Click & Zoom" mini book (as seen in the Creating Keepsakes Minibooks 2013 special issue). When you look at the cut files, you'll notice the SVG version is slightly different to the .Studio version because I was too lazy to redo my SVG file for this pink mini book- cough! If you are confident in the Silhouette software, I suggest you adapt & cut which ever pieces you'll need for whichever version you decide to make. Oh Baby! Camera mini book by Kim Watson: Supplies: Cardstock: American Crafts; Patterned paper: Echo Park; Stickers: Lilybee, Heidi Swapp, Alpha Stickers & Buttons: Bella Boulevard; Ribbon & plastic embellishment: Pebbles Inc; Stamp on back: Technique Tuesday; Ink: Close to my Heart; Adhesive: Tombow, 3L, Eleene's; Tools: Cutting mat, trimmer & scissors: Fiskars, Die cutting machine: Silhouette Cameo; Other: Jump Pings, Safty pin, Bone Folder. Inside I included 3x4 cardstock cards with rounded corners to hold my photos. The jump ring makes it easy to flip through the piccies. A quick note about the 'lens'. All I did was concertina 2"x12"strip into 2"squares and then keeping one folded side intact, scissor cut a 2" circle shape. Using foam squares I lifted each layer, giving the lens height & that zig-zag effect. The stamp on the back is to capture the time, date & info pertaining to the photos. 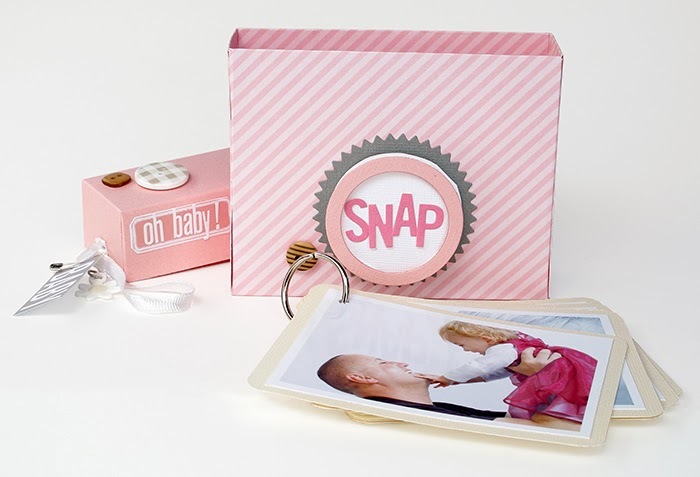 Have fun making yourself one of these... they make the BEST baby shower gifts. NB: If you use the cut files (your personal use only) please remember to acknowledge Creating Keepsakes magazine or myself when posting online. Thank you for stopping by crafty friends, I look forward to seeing your lovely creations!